I'd choose the Jolly Rancher Apple Green one. As you can see, [and if you haven't yet noticed], I like green. But, it isn't me, it's YOU! A handmade, stained glass star! My dad has just opened up a new Etsy shop and is generously allowing the winner to pick ANY star ANY color ANY size! Take a quick visit over there and leave a comment [here] about which one you'd choose. They are all really nice but I agree with you. I would pick the jolly rancher green apple star. Thank you both for your generosity! nope, just kidding. i love the clear patterned one the best. how did i miss it the first time? I'd take the lime green textured, or the kelly green. I love them! I'm so excited he's selling them. I'm going to have to save my pennies and make a big order. I love them hanging from the ceiling like that! Wow! He is so talented! I LOVE the clear star with all the different textures in each triangle! Beautiful! JOLLY RANCHER GREEN is my pick!!! how is SOOOO much talent bundled into just 1 fam?!!!! Love the stars....all of them!! Hoping to win! So happy for your father-I hope the shop takes off! I was drawn to the plum colored star, but the reds were all beautiful! best of luck, Katy's dad!!! I really love that dancing plum star. These are so beautiful! I'd love a collection in my boys' room. I love them all, but the jolly rancher green is my favorite too! I love the jolly rancher green one also but I love the clear one too! They are all so pretty! Either the amber or the ruby...oh so pretty. Thank you for the chance. What a great giveaway! I LOVE these stars! Everyone always comments on them whenever they come to my house. I love the blue one with the clear center. Fantastic! it would be perfect in my living room. I want the deep red textured, with the face. It will be mine! What a generous offer and such beautiful artwork! I love stained glass and I was drawn to one of the lime green stars with the clear center. The dolls are amazing too...especially the cat woman. Thanks for the chance! How beautiful! I think my favourite would be the ruby red star! Wow!! They are amazing. I think I would go with the ruby red. Very lovely all of them. My children would love to wish upon the jolly green one. That is a hard one but I really like the Ruby Red Dipper, but I love red! The Jolly Green is really nice too, but I am a red girl. I have to agree...the Jolly Rancher Green one is wonderful!!! Its kind of traditional, but the clear star speaks to me. I love all of the different textures. All of them are neat. It'd be great to have a whole window of them. But my favorites are the lime green textured one or the golden amber. I love all of them, but I love the Amber Face Glass Star the most. Your father is truly an artist!!!! Ooh, I love the plum or the lime green! Gorgeous! Ruby Red Dipper. My porch, kitchen, bathroom, and living room all have red in them. These are truly beautiful. What a fabulously talented and creative family you all are. Your Dad's work is beautiful. I especially love the clear textured star. Gorgeous. I love those stars. I can't decide between the royal blue or the Jolly Racher green. I suppose I would need to buy one of each. I love, love these stars, and I love all of your giveaways. I'd choose the plum, although it was a tough choice between that and the orange one. I love the clear patterned textured glass star! I's very feminine and would look great in my window or on my mantel. Tell your Dad congrats on his new shop! wow! these are all gorgeous! it's tough to choose but i really love the clear patterned texture star and the jolly rancher green. thank you for the great giveaway! Oh dear - You are beginning to have far too many followers and fans. I love the plum. We call Neva 'plum'. Did you know that? Oh, so hard To choose. They are all so beautiful!!! I love colored glass. ...and I love stars. I think I would pick the royal blue and clear one. Ditto on Jolly Rancher Apple Green. So cool! Love the green and lavender. I love love love the plumb one! Ps Your Dad is so generous! Ooooh, love the stars! I collect stars and just love these. I'd have to choose one in amber. Love. The orange one. Always the orange one! They are all fantastic, but I would pick the Ruby Red Dipper to give to my daughter for her new place. I can envision the perfect spot for it. I LOVE them all, but my favorite is the lime green. It's so generous of you and your dad. Your dad's etsy shop is going to take off...rightfully so! clear. I like the clear texture. I like them all but I think that the dancing plum is my favorite. The clear patterned one will look gorgeous as number 5 in my collection. I love Kurt and Becky and their family! i am a friend of jordan's from medical school... i love to read your blog. and i LOVE the color green too, so i would pick the jolly rancher apple green one too! Most def the amber faced yellow one! Gotta love the Ruby Red Dipper Stained Glass Star!! Most beautiful! I like the green one, too. I like the royal blue and clear one. Though, the 13" green one had me think twice! So beautiful! Your Dad is very talented. If I am lucky enough to win I would definately go with the Royal Blue and Clear Frost Stained Glass Star, however I really love the dancing plum start too!! What a neat idea. They are all so beautiful! I love the lime green textured star. lime green with the diamond cut faceted center. these are gorgeous! I'd pick the green one too! It would go with the colors in my kitchen! I LOVE these stars, they are so beautiful! The Apple Jolly Rancher is lovely, and typically I go with green as well, but I'm loving the Amber Face. I like the lime green textured star! i LOVE the lime green textured, the lime green one, and the red one! hmmmmm.........so many choices. I'd probably have to go with the lime green textured one! I really like the clear textured star! Very beautiful! Clear patterned textured glass star is definitely my favorite. Love them all. I am moving to our first home ( YAY) and my kitchen will be green and yellow. This star would be a lovely in there! They are all beautiful though! I LOVE these! I think I would choose green, as well. But the orange and royal blue are a close second. I love the amber one with the face! Jolly Rancher Green for me! I love green it's by far my favorite color. Followed closely by teal. The way you love green is the way I love purple, so lavender star for me! The lemon custard and the jolly rancher green are my favorites! ooh! yeah, the jolly rancher one. i can see it in my garden! it's all green perennials with white flowers. Love it. Wow, impressed with your Dad!! I dig the green, but I also love the royal blue and clear one. How can you choose just one? How beautiful! I like the "A juicy lime green star with a "diamond" cut faceted clear glass center." I would definitely go for the green. Jordan made a few of these that I gave away for gifts several years ago. I need one for myself! I like the ones with the faces, but which color? I love the "Plum" star that looks like it's dancing. So whimsical! I love the green jolly rancher one!! I would so choose the lime green stained glass star with the face! SO CUTE! Your daddy is amazing! Blue is lovely, but my favorite is the green apple as well. Though the gold with a sunshine face is darling. I have to choose just one?? They are beautiful. I would pick the Jolly Ranger Green one. I like the plum colored one! How cool to have a dad who makes such lovely things. Yeah for Jolly Ranchers! I like the green one best too! I'm a big fan of Red. So I think I would go with a red one? But the green was is super cute as well. So hard to choose! I would say, "Kurt, you choose!" How generous of your dad! Thank you! I'd love the lavender star - it would be a nice start to what should become a collection at my house! Lovely!! They are all so lovely but I love green and I think the jolly rancher green one is my favorite. I keep changing my mind but I love the Ruby Red dipper and the Jolly Rancher Green, oh and the orange! I would probably go with Ruby in honor of my baby! Someday I vow to buy a whole window full. I want to keep them up all year long. Congratulations on a beautiful shop!! Oh my, these are gorgeous! I can't decide between ruby red or royal blue. But looking at them makes me want to learn how to make stained glass! These are gorgeous and would be perfect hanging in my breakfast area window. I am loving the Gramma Fae's Lemon Custard Chandelier Star. Oh my they are all so beautiful and unique! I am leaning towards the lavendar one or green for my sunroom! I love them!! So beautiful!!! I would also choose the Jolly Rancher green one! I love the Jolly Green Star....so pretty to hang year round! Wow-- congrats to your Dad! Such lovely and unique pieces. I especially like the clear patterned textured glass star. I would hang this beauty in my garden-- Thanks so much for the chance! I love the jolly rancher green star! So pretty!! my collection could use more red - ruby red dipper to be exact. so glad I can easily buy these!! They are all beautiful, but I love the plum one. I would love to lay in bed and see it in my bedroom window. Kelly green. It makes me think of Ireland. Christy's funny, and your sister Jordan is on here, funny! I like the blue, and then I would want the green. I love the clear one, just think of the colors shining through is cool. green, green, green over here! i really like the lime green textured one. I'm enchanted with the Grandma Fae's lemon custard chandelier. Thanks for this giveaway. They're ALL so pretty! I love these stars! I cannot wait until I can order my own! You know, this green one would go perfectly in my new kitchen...which is almost done...famous last words! red! I have a thing for red accents around the house. 8 1/2 inch lime green glass star is what I'd choose. What a glorious, lovely color that so beautifully glows in the sunlight... dreamy. I really like the lime green stained glass star and the jolly rancher apple star. I think the Jolly Rancher Green one is just so, so pretty! Perfect to shine on a window on a beautiful sunny day! 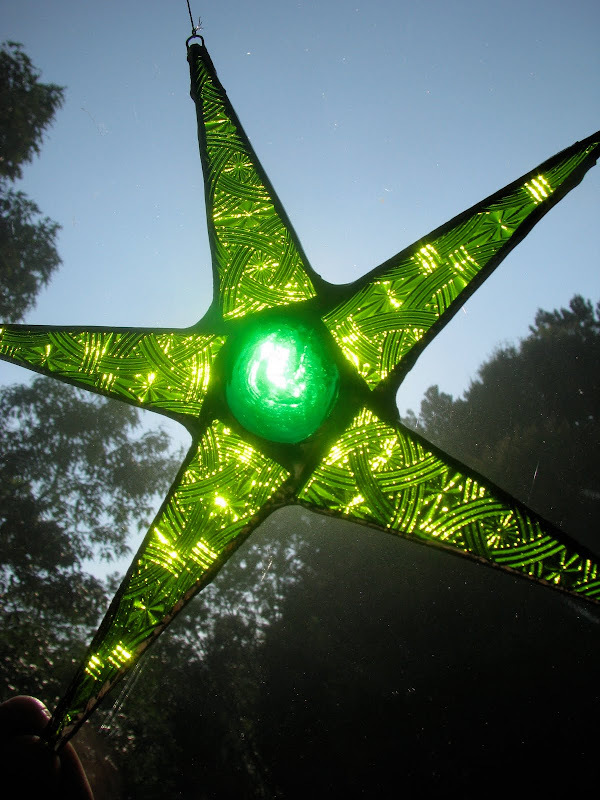 Lime green glass star. Enough said. They are all so beautiful! As much as I LOVE pink, that green is absolutely gorgeous!! I LOVE the orange! Wow! What talent! Gramma Fae's Lemon Custard, although I love them all! i love the lime green star. but they're all beautiful!! All of the green ones are great! Green's my favorite. Orange!!! The hubs doesn't agree but you can never have too much orange! 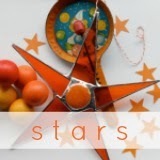 The orange pointy star is utterly fabulous! The lime green textured! They are all so beautiful Thanks for the chance to win something so special! Oh boy, that would be a difficult choice, but I would have to go with the orange one. I've really been diggin' orange lately and I love that is long and skinny. I choose the golden amber one!These are just lovely,good luck with the shop. Hard choice, they are all so purty! I think my favorite would be the amber colored face star. How generous of him! I hope I get picked. Great giveaway!